If you’re the person who hasn’t seen it yet, go right now – we’ll wait. Officially, he’s the Internet’s most beloved and popular cat — not that he gives a $&*#. From Halloween costumes to Today Show appearances, this social media phenom is the cat’s meow. The next morning, people were talking about that Tweet almost as much as the ads companies paid millions to produce and air. That’s the simple beauty of an Oreo social media. Your grandmother did it. Your next door neighbor did it. Almost 20 million people nearly shipped their pants watching this hilariously wrong yet oh-so-right video touting K-Mart’s online store. While some groups were offended and their “Big Gas” follow-up wasn’t nearly as funny, this ad got the 12 year old in us talking, and sharing, to the tune of almost 20 million views. Holy smokes, that sure is eye-opening. Real women describe themselves to a sketch artist and then compare the sketch to one made based on the description that others gave of them. The ad went viral and hopefully reminded women to embrace their natural beauty in the process. They call it real beauty, we call it real effective (56 million+ views effective). 7) What does the Fox Say? We’re still not entirely sure what foxes say, but the Norwegian comedy duo Ylvis has made their guesses into a YouTube sensation. The video has already been parodied by the Fox Television network, SNL and has earned a place in modern culture. When we see the almost 190 MILLION views, all we can say is “Wa-pa-pa-pa-pa-pa-pa-WOW”. Fist pumping can go away any time now, but we hope Story Bumping is here to stay. Facebook has tweaked their algorithm, Edgerank, to now find the most relevant content to post at the top of your News Feed — rather than only the freshest content. If you missed something relevant that was posted since your last post, Facebook will have it waiting for you near the top when you return — which we’re sure won’t be that long! 68 percent of the top 50 internet retailers use video on their sites and the new video options from Twitter (Vine) and Instagram allows companies to add yet another vehicle to their content strategy. It’s extra attractive because they’re easy to use and do not cost a lot of money. Think these videos are only for sharing short, looping, potentially embarrassing scenes from your New Year’s party? Brands are putting the new media to work and getting noticed for their efforts. In June, Facebook asked “Why should Twitter have all the #Fun” and introduced hashtags on its platform. The Facebook implementation gives each hashtag its own URL, allows creation of hashtags in new posts and on the hashtag’s page and searches for hashtags in the normal search box. These hashtags allow the enormous Facebook audience to virtually congregate (during primetime television alone, there are between 88 and 100 million Americans — roughly a Super Bowl-sized audience — engaged on Facebook every single night). Though the feature is, shall we say, in the ‘early adopter stage,’ we see plenty of room for Facebook hashtags to #RockOn. Businesses welcomed the new advertising options introduced on Facebook and Twitter this year. Facebook introduced “Partner Categories” which allows advertisers to more specifically and effectively target their ads to customers. Remember the olden days when advertisers could only show ads to users based on the interests they’ve indicated on Facebook? With Partner Categories, Facebook can now access behavioral information of its users across social media outside of Facebook. Not one to be left behind, Twitter introduced a “Lead Generation Card” to their Twitter Card suite which allows users to easily and securely express interest in a brand without leaving Twitter or filling out a cumbersome form. In what has been heralded as a big boon for Facebook page administrators and brands, Facebook’s page insights can now handily measure reach between fans and non-fans, see the most optimal posting times for their brand, and enjoy access to official statistics for engagement rates. This information is crucial for effectively managing social media campaigns and had previously only been available abstractly in some 3rd party tools. Like! If you’ve ever tried to run a promotion on Facebook, you know that following their terms and restrictions means using a custom app to do it, right? Not only was this costly, but it added layers of difficulty and management to what could have been a simple contest. Then, Facebook updated their Page Terms to make it easier for all businesses to administer promotions on Facebook. They removed the requirement that all promotions must be administered by a third party app – now brands can host promotions within their newsfeed and through message submission. The menu at our local Chinese restaurant claims it’s the Year of the Snake but we think 2013 might be the Year of the Facebook! The launch of Rignite! Now online businesses can turn social activity into real, measurable results. Grow your following, boost engagement, drive sales, and increase customer loyalty. All in one, easy-to-use interface. 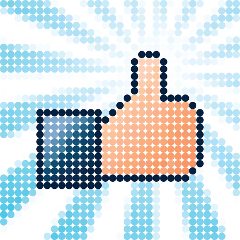 Tell us…what do you think was the most significant milestone for social media in 2013?